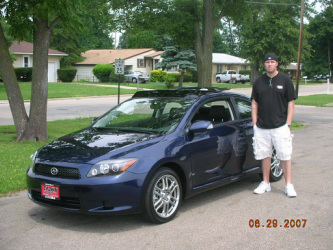 This page is an overview and progression of my 2008 Scion tC. The car was purchased brand new on June 29, 2007 from Crown Toyota Scion in Decatur, IL with only 32 miles on it. The car was specifically ordered to guarantee the 1st 2008 tC in the area to ensure getting all of the new features the 08 provided over the 05-07. After ordering the car in late may, the modding began before arriving. Audio from previously owned vehicle was pulled, new exhaust, 7" touchscreen indash ordered, a little bit of glow, and a Fujita F5 intake were in before the car. After the car was in, the parts went directly on (car was debaged before even leaving the lot or plates on the car). Within two weeks the car was already modified w/ stereo, glow, intake, exhaust, intake and air diversion panel at its first show in Kewanee, IL taking 'Best in Class' and 'Longest Distance'. After success from its first show, and meeting a few others at the show, more shows were to come along with a few other awards ending the very short 3 month season with 6 awards.